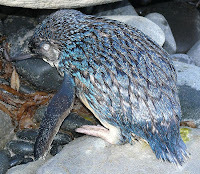 Along the rocks today I came across this Little Penguin (Eudyptula minor). He struggled out of my way, and I caught sight of him moving out of the corner of my eye. I realised he was either ill or injured. He propped himself on a pebble sitting next to a large flat boulder, and just sat there shivering and shaking, with laboured breathing. He wasn't very happy about me being there, but he wasn't moving. When I came back along the beach about 45 minutes later, he was in the same spot, hadn't moved. The crows had spotted him, and had flown/sat around him a bit. He grumbled at me very slightly, but didn't appear to have the energy to do anything. I have no idea what was wrong with him, nor whether you can pack up penguins and "save" them. If I found a baby wombat, I know that if it was large enough you could save it, but I thought any attempt to save this little fellow would probably be abortive. Apart from anything, he was quite unhappy with my presence, and I suspect he'd have just carked if I'd picked him up. Poor little guy. I've never seen a baby penguin before. Yes, he was a sad little thing. I think he was probably an adult. My book says these are the world's smallest penguin, 330-440mm. He'd have been about 350mm tip to tail. Looks like an interesting day. Shame about the penguin. Seems to be a lot of sand on it. Maybe it was injured in the surf. I should have mentioned the sand. He wasn't making any attempt to clean it off, so that added to my assessment that he wasn't in any state to do anything to help himself. I don't know if penguins deal well with surf - you'd think so, but the surf can be huge and rough at South Cape Bay, and breaks on reefs and boulders as well as sand.